In 2005, Highpoint Editions proudly presented Breathing Spaces, an exhibition featuring prints from a three-year collaboration between Boston-based artist Joel Janowitz and Master Printer Cole Rogers. 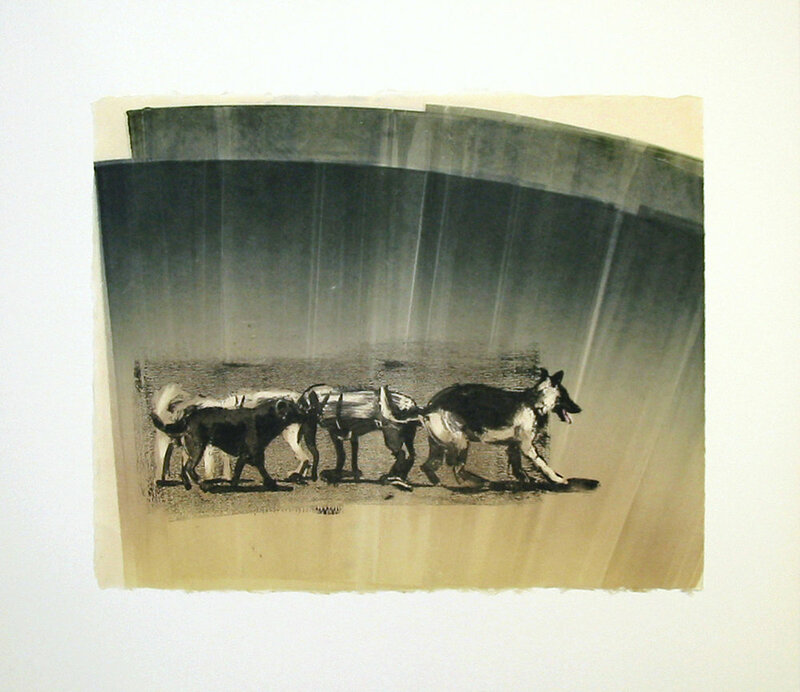 Among the lithographs and monotypes on view are scenes from the Wellesley greenhouse (a space that Janowitz has long explored) and images of dogs engaged in gestural play. Janowitz is well known for his masterful ability to instill a realistic setting with a dream-like, meditative mood, and these qualities are prominent in the new work. The story of Joel Janowitz’s collaboration at Highpoint begins in 2002, when Cole Rogers and Executive Director Carla McGrath invited the artist to visit Highpoint and begin a new body of prints. Janowitz traveled to Highpoint that July, where he worked on a variety of litho plates and stones. 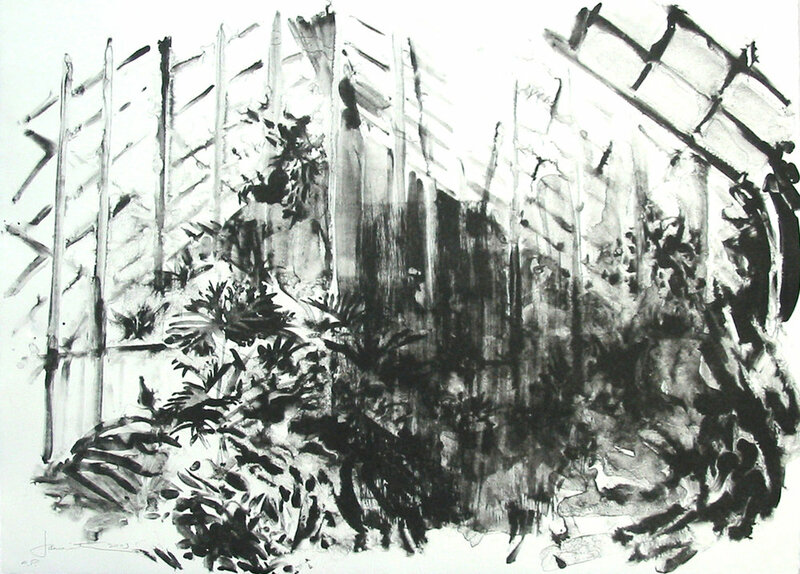 The greenhouse imagery and “Dark Dog” images produced during the visit would set the theme for the overall project. After Janowitz departed, Rogers and staff pulled additional lithographs from these original sources. 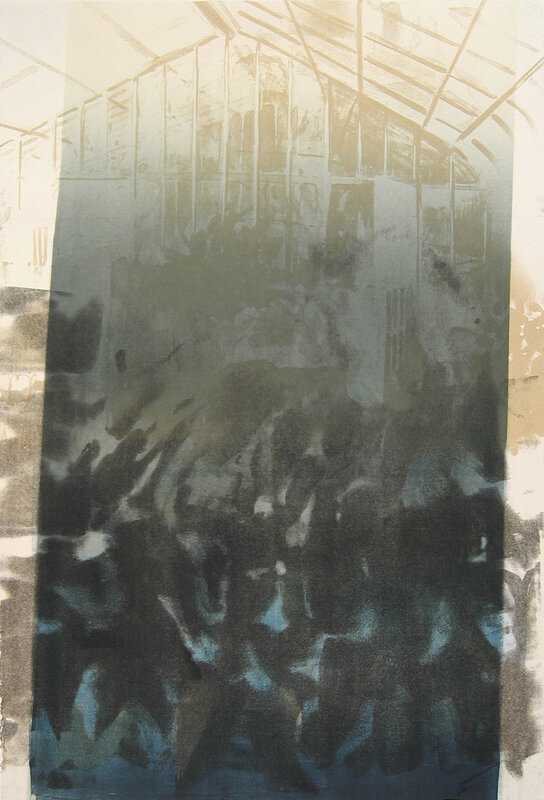 Some of them were mailed to the artist, who layered on additional monotype in his Boston studio; others were editioned here at HP. Over time, more prints and drawings were sent back and forth in this fashion. Another short trip to Minneapolis by Janowitz added to the momentum and informed the project even more. The resulting prints faithfully capture Janowitz’s unique artistic vision and delicate, painterly hand. 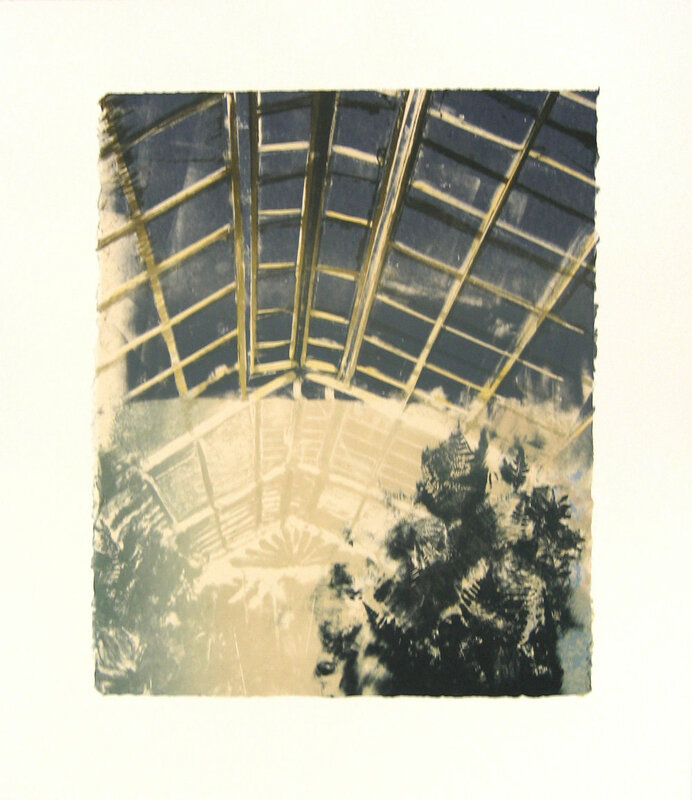 As different environments coexist in a greenhouse space, clear representation and mysterious abstraction come together in these new prints. 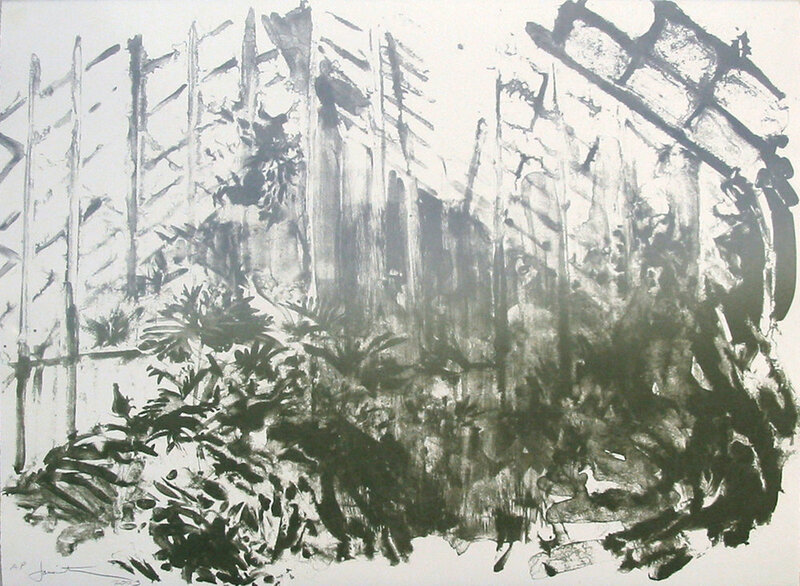 In Janowitz’s greenhouses, lighting and color have been exaggerated or muted to an unnatural degree. 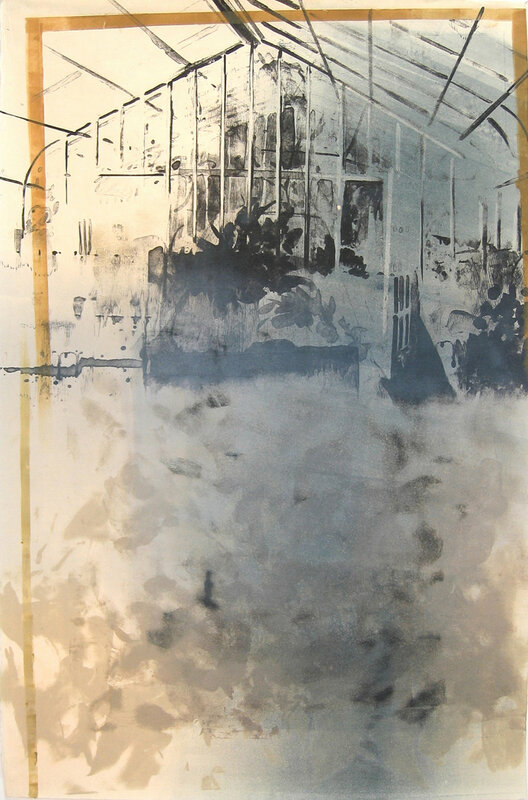 Yet, the viewer is able to gather a complete picture of the space—one that is inviting and evocative of misty air and thriving plantlife, but viewed through the lens of another time or place. More information on Janowitz is available on his Artist page.